kalishankar export is a leading manufacturer, exporter and supplier of tea tree oil (tto) in kannauj (india). The tea tree oil that we offer is extracted from melaleuca alternifolia of the myrtaceae family. This oil is one of the most used essential oils and there are many who have been benefited by its wonderful healing properties. Extracted from the leaves and twigs by the process of steam distillation, it has a light, spicy and rather pungent smell. benefits : tea tree oil can be useful for antibacterial, balsamic, antiviral, hair care, stimulant medicine. T his can boosts immune system and reduces dandruff & hair loss. Tea tree essential oil can provide relief from muscular pain, aches, and sprains because its strong chemical properties can work as an anti-inflammatory and also encourage blood flow to a specific area (being a stimulant), which speeds up the healing process and increases the rate of new tissue and cellular growth. blending : this essential oil blends well with cinnamon, clary sage, clove, geranium, lavender, lemon, myrrh, nutmeg, rosewood, rosemary and thyme essential oils. constituents : alpha-terpinene, a-pinene, b-pinene, gamma-terpinene, sabinene, myrcene, a-phellandrene, a-terpinene, limonene, 1,8-cineole, y-terpinene, p-cymene, alpha-terpineol, terpinolene, sesquiterpene, linalool, terpinen-4-ol and a-terpineol. aromatic description : tea tree oil is medicinal, fresh, woody, earthy, herbaceous. 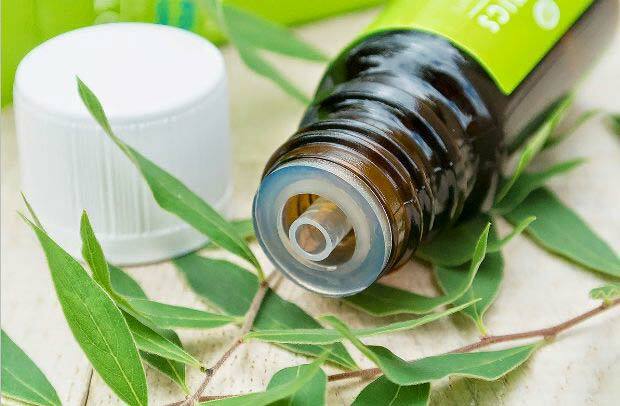 tea tree oil uses : acne, athlete's foot, candida, chicken pox, cold sores, colds, corns, cuts, flu, insect bites, itching, migraine, oily skin, ringworm, sinusitis, sores, spots, urethritis, warts, whooping cough.